Gasteria glomerata is a very attractive, dwarf species, bearing rounded clusters of grey-green, slightly rough (tuberculate) leaves. It is ideal for containers in a shady spot or grown in rockeries. It is easily recognized by its small rosettes of opposite, very succulent strap-shaped leaves and fleshy (gasteriform) flowers. It is easily grown and is one of 20 Gasteria species mainly confined to South Africa and southern Namibia. Plants stemless (acaulescent), decumbent to erect, 15-40 x 20-50(80) mm, proliferating from the base to form dense clusters up to 200 mm in diameter. Leaves distichous, 15-25(50) mm long and 15-20(25) mm broad at the base, firm, strap-shaped (lorate) to widely ovate, the inner erectly spreading, the outer spreading (patent) or recurved, biconvex in cross section to almost rounded (terete), becoming flattened during the dry season. The surface is glaucous, without any spots. The skin (epidermis) bears minute tubercles (tuberculate-asperulous). The leaf apex is truncate or rounded, bearing a mucro. The inflorescence consists of a spreading raceme, 120-200 mm long, bearing 8-20 hanging (pendent) flowers. The flowers (perianth) are striking reddish pink, 20-27 mm long, bulbous (gasteriform) at the base for slightly more than half of the perianth length and up to 10 mm in diameter. Once pollinated, the capsule, 13-15 x 6 mm, becomes erect. Its Seeds are black, 2-3 x 1.5-2.0 mm. Flowering time: spring. Gasteria glomerata is a rare endemic confined to the lower Kouga River, now part of the Kouga Dam. Although it is rare, its status is not threatened at all due to its cliff face habitat and it is protected within a reserve. The seed is also dispersed world-wide and the plant is commonly grown in many collections. Its ease of propagation ensures that it is not necessary to collect plants from the wild. 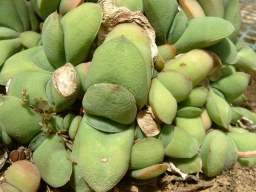 The terrain of Gasteria glomerata is rugged, (Fig. 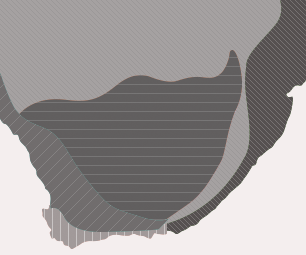 135), inhospitable and the plants occur on sheer, vertical, shady, south-facing rocky ledges (altitude 500-700 m), in minerally poor, slightly acid quartzitic sandstone soils of the Table Mountain Group (Cape Supergroup), with a ph of 6.4. The plants occur in small or larger, dense clusters. The cliff-dwelling habitat of G. glomerata is rich in succulent and succulent bulbous plant species. The vegetation in the region consists of succulent thicket, with Fynbos on the upper slopes. Associated succulent herbs and geophytes in the habitat include Portulacaria afra, Adromischus cristatus var. schonlandii, Cotyledon tomentosa, C. velutina, Crassula cordata, C. cultrata, C. muscosa var. parvula and Haworthia translucens. Succulent bulbous plants include Cyrtanthus flammosus, C. montanus, C. labiatus, Ornithogalum longibracteatum and Haemanthus albiflos. The climate is hot in summer and mild in winter with no frost. Annual rainfall of 300-400 mm occurs in summer and winter, but there is a tendency to winter dryness. Diagnostic features and variation: Superficially Gasteria glomerata resembles G. baylissiana which has rough, dark green leaveas and smaller flowers. It is also related to G. glauca, which has rosettes and pointed leaves flowering during early summer. The specific name glomerata means clustered into a head and pertains to its densely arranged flower clusters. 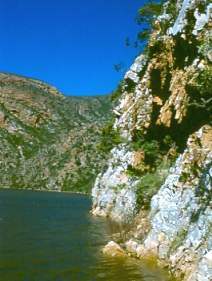 It was discovered, and subsequently described by the author (Van Jaarsveld 1991), whilst exploring the succulent rich cliffs with binoculars from a boat on the Kouga Dam. It was then propagated from its easily grown rosettes, the flowers were hand pollinated and the seed was distributed to people world-wide. 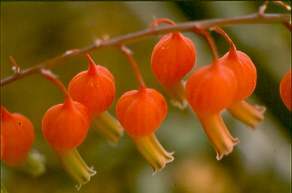 Gasteria glomerata is pollinated by sunbirds. Its fruiting capsule, opens from the top to release the flattish seeds. The fleshy leaves store water and are therefore drought tolerant, making this an ideal water-wise garden plant. Even though its habitat on the cliffs is very exposed, and is bone dry at times, the plants receive enough water from seepage for survival. Gasteria glomerata is popular due to its horticultural value, and can be grown in small containers or in succulent plant gardens. 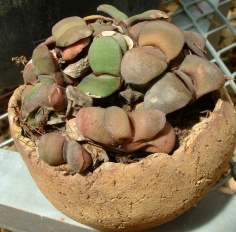 Gasteria glomerata is easily propagated from leaf cuttings or seed. It is a slow growing, but long-lived species. Leaf cuttings should first be allowed to dry and heal by placing them on a cool windowsill for at least three weeks. The basal part should preferably be treated with a fungicide. Plant the leaves in an erect position or lying on their side in sandy soil. Rooting is rapid and young plants can be harvested the following season. Plants are easily pollinated by using a matchstick to transfer pollen from one plant to the ripe stigma of another. If fertilization does not take place, the flower will abort. Seed should be sown during spring or summer in sandy, well-drained soil, and protected from full sun. The seedlings are slow growing and can be planted out in small containers when they are large enough to handle. The soil should preferably be enriched with compost. They react very well to a liquid organic fertilizer.